Enough of kitchens for now – back to Autumnal Recipes – Part Two. As the nights are now drawing in earlier on the East Coast of Yorkshire, and the log burner is lit about 4.45pm to warm up our lounge, I feel the need for more comfort food. There is an abundance of amazing vegetables and fruit that are crying out to comfort us at this time of year, and I’ve just found a recipe that I know both Erik and myself will enjoy. This recipe contains squash, sage and hazelnuts, and I love all three ingredients. What’s even better is that it sounds fairly healthy as well. Roast Squash, Sage & Hazelnut Orecchiette Recipe. Autumnal Recipes – Part Two. Roast squash, sage & hazelnut orrecchiette. – courtesy Delicious mag. Don’t be put off by the type of pasta – the Orrecchiette pasta is named after what is called a ‘little ear’ in English. If not available for your Autumnal recipe, just choose another similar one, like Farfalle or even a simple Penne pasta, that will take in a little sauce or oil or even balsamic vinegar. Roast squash, sage & hazelnut orecchiette. 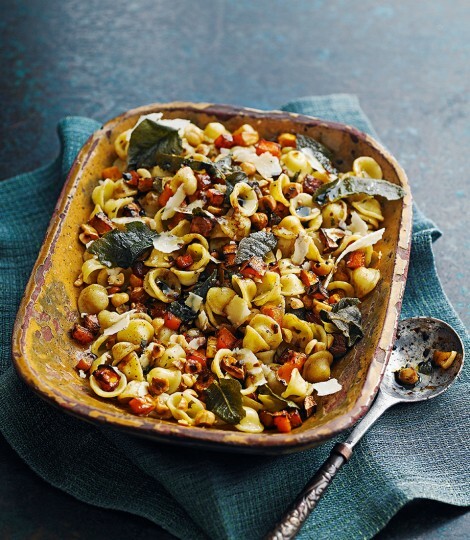 This Roast squash, sage & hazelnut orecchiette recipe reminds me of my time in Italy. It is a comforting and tasty pasta dish, and probably tonight I will make a quick rocket salad, mixed with thinly sliced radish, red onion with a few dry-toasted pine nuts thrown in for crunch. Erik and myself are trying to eat more vegetables in our diet, both for health and the fact that we grown them in our kitchen garden. Heat the oven to 200C/180Cfan/gas6. Chop and de-seed the squash, cut into bite-sized chunks, then toss with a good glug of olive oil in a large baking tray and season. Roast for 40 minutes or until browned and tender, adding most of the sage leaves and chopped hazelnuts for the last 5-6 minutes. Around 15 minutes before the end of the cooking time, bring a pan of well-salted water to the boil, and add the pasta. When the pasta is al dente, drain well and transfer to a large mixing bowl. Warm up a tablespoon of olive oil in a small frying pan and carefully fry the remainder of the sage leaves until just crispy. Gently take the leaves out of the pan and place on kitchen paper to drain. Toss the squash mixture through the pasta along with the balsamic vinegar and a generous amount of seasoning. Stir through a glug of extra virgin olive oil, divide among bowls, then top with the parmesan (or vegetarian alternative), and the crispy sage leaves and serve. Apart from peeling and chopping up the squash for this recipe in Autumnal Recipes – Part Two, this recipe is quite easy to do. I would even use it when entertaining friends, in a great big ‘help yourself’ dish. It is quite a hearty dish, perfect for Autumn/Winter, but I would maybe start with a shot glass of Gazpacho, (OK, I know it’s Spanish), and finish with a light dessert (or pudding as we say in Yorkshire). What about Pear Sorbet with Pear Wafers? Pear Sorbet with Pear Wafers – courtesy Delicious magazine. This Pear Sorbet with Pear Wafers recipe is a refreshing and light dessert, great for entertaining friends. This autumnal time of year is perfect, with pears being taken off the pear trees to ripen up. Hopefully next year I will be using my own pears from my orchard to create this dessert. Slice the pears, discarding the cores, and put into a pan. Add the sugar and 100ml water. Stir to dissolve the sugar over a medium heat, then simmer for 15 mins until the pears are soft. Cool for 15 mins, then tip into a blender with the lemon juice. Whizz until smooth. Cool, then stir in the liqueur. Meanwhile, make the pear wafers. Preheat the oven to 110C/Fan 90C/gas1/4. Put the sugar and 50ml water in a pan over a low heat, stirring to dissolve the sugar. Increase the heat and boil for 2-3 mins Cool. Use a mandolin to slice the pears very thinly - there is no need to peel, de-stalk or core them). Discard any small outer slices. Coat the perfect slices in the syrup, then lay on a lined baking tray and bake for 2 hours, turning half-way, until dried and crisp. Peel off the paper to prevent them sticking, then lay them back on the paper to cool and crisp up further. If you haven't made the sorbet in a machine, transfer to a processor and whizz until smooth. Put back in the container and freeze until needed. Transfer the sorbet to the fridge for 10 minutes. Scoop in bowls and decorate with a pear wafer. 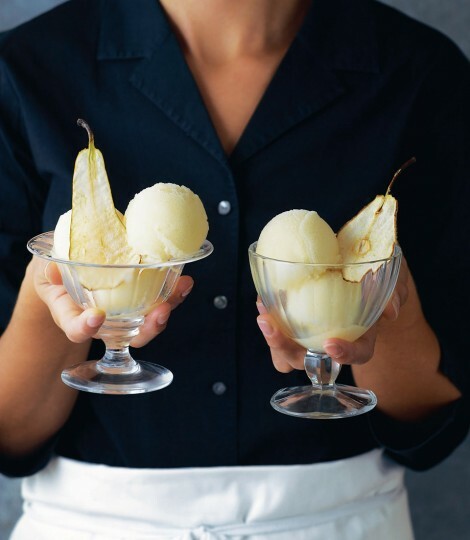 The Pear Sorbet with Pear Wafers is a great one to prepare ahead. It should last for a month, or even two months in your freezer. Imagine it on Christmas Day when you could play around to your heart’s content with the edible Gold spray, from such as Lakeland UK, or even Gold foil crinkled around the icy cold sorbet. Your dessert would be very special. There are so many different recipes to choose for Autumnal Recipes – Part Two, and no doubt there will be a Part Three and Four, now that my appetite is returning. I believe the Chemotherapy drugs must have almost left my system – even my hair is a bit fuzzy now, like a blond Halo around my head. Well, it’s a start, isn’t it? Soon I will be starting Radiotherapy – now that’s another story! But hopefully a good one. So keep watching for more comfort food warming recipes. I know we will be in need of them, and here’s hoping you enjoy them too. I’ll be trying this yummy sounding recipe without the nuts. I’m SO excited about this recipe. I’ll be tackling this head on tonight. I love this site, it’s inspirational educational and heart warming. Hi Susan, lovely to hear from you. I do hope you enjoy this recipe, but I am a bit confused as I do think I remember you had a bit of a problem with nuts, didn’t you? Do take care, or leave out the nuts. Regard, as ever, Astrid. I’m always inspired by your adventures and recipes. The Autumn recipes are mouthwatering and I’m going to buy pasta this weekend and get busy in the kitchen. When autumn arrives and the evenings draw in we love our logburner too. I shall be following your autumn and winter blogs and we’ll be trying your recipes too. My husband loves pasta and squash so he’ll be in heaven, and we love sage. I have a big bush and it needs some taming for sure. Thank you from two sage and squash lovers. Autumn is a special time for us, more so this year as we will be celebrating fifty years of marriage. We almost live parallel lives with Erik and Astrid. We have a kitchen garden, similar kitchen and ideas about food. We don’t have Astrid’s energy but we plough on as Ulysess said. We make a sage dumpling with a puréed ball of smoked bacon in the centre. Great with a beef stew. Thank you so much Lolly. Getting my appetite back helps to write more educational posts I hope. Regards Astrid. Thank you Thora. Glad you like our recipes – it is great to feel hungry again now the Chemo drugs are leaving may system. Don’t waste your sage bush as you can dry and freeze the aromatic leaves without too much pain. Regards Astrid. Hi Bennet, congrats for 50 years of marriage. Your sage dumpling sounds different – sage must be the ‘in’ herb this week. Please keep enjoying our recipes. Regards Astrid & Erik.